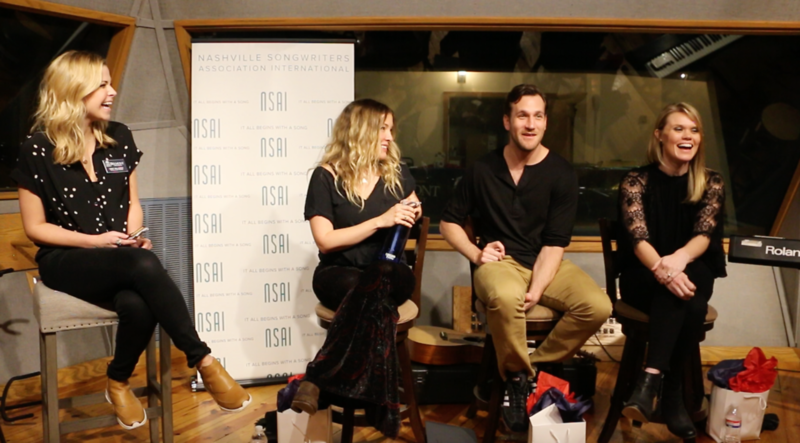 Through an alumni networking series piloted last fall called “Career Conversations: Bruin to Bruin,” current students visited the Nashville Songwriters Association International (NSAI) on January 11 to hear from three Belmont alumni currently working in the music industry. The event had around 70 students and alumni in attendance as songwriters Sarah Buxton, Abe Stoklasa and Nicolle Galyon offered advice on owning your craft, dealing with rejection and navigating college life while simultaneously pursuing a career in the entertainment industry. The event was hosted by NSAI Marketing Manager and Belmont alumna Libby Oellerich in conjunction with Belmont’s Offices of Alumni Relations and Career & Professional Development. Buxton is one of Nashville’s top female songwriters and is currently signed with Big Loud Shirt Publishing. She has had songs cut and released by Big & Rich, Gary Allen, The Band Perry and Martina McBride as well as two songs that topped the charts at number one: Florida Georgia Line’s “Sun Daze” and Chris Lane’s hit “Fix.” Stoklasa currently works as a full time staff writer at Big Yellow Dog Music in Nashville and has had cuts by Blake Shelton, Tim McGraw, Ben Rector and Lady Antebellum. He also worked with Buxton on Chris Lane’s number one hit.